Celebrating 10 years in business this year, Ecoplant Hire is a unique Irish business that specialises in the hire of electric construction plant. Its product range offers clients a safe, eco-friendly and low-noise solution for construction firms operating within live, tight and enclosed sites. It also means there is no requirement for on-site fuel storage. 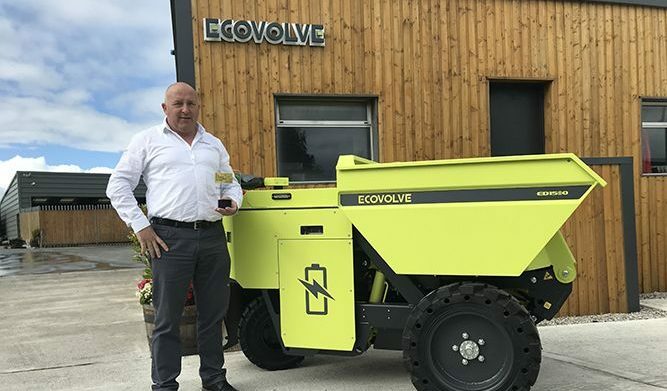 In 2015, the company moved into manufacturing with the establishment Ecovolve, when it developed the world’s first high tip electric dumper, which it now exports worldwide. Sean Breen, founder and Managing Director, Ecoplant Hire and Ecovolve, says that much of the success of the company is down to the uniqueness of the product range it offers. “When it comes to on-site safety, particularly where a client is working within an operational manufacturing or pharma plant, or enclosed building space, our range of plant is an ideal solution because it has zero emissions and makes minimal noise. There is also the added benefit of not having to store fuel on site. The Ecoplant Hire product range includes electric diggers, battery-powered dumpers and electric saws and compactors, as well as electric forklifts, powerfloats and Brokk remote demolition machines. The company also provides generators and all required ancillary plant and attachments. “The large plant used on many construction sites cannot be utilised on smaller and enclosed sites. Our compact but durable equipment has solved this problem for many clients,” says Sean Breen. The company’s move into manufacturing in 2015 was brought about by Sean Breen’s observation that clients were using wheelbarrows and more inefficient equipment to remove rubble from enclosed sites. The company employs five people directly at its plant in Ballybrittas, Co Laois, with a further 10 people employed indirectly. All steel and raw materials are sourced and machined in Ireland. To date, Ecovolve has exported over 100 high-tip electric dumpers to clients all over the world, and there are now three unit types in the Ecovolve range: the ED800, ED1000 and ED1500. “It is still early days for the Ecovolve high-tip electric dumper, which is the only product of its kind in the world, but we are working closely with Enterprise Ireland to build a global market for the product, and we are delighted with our success to date,” comments Sean Breen. “Ecoplant Hire is also doing very well, as we are again in a unique niche with high demand for our products. Our success can be measured by the fact that our customers include many of the CIF’s Top 20 companies. We look forward to providing them and others with safe and eco-friendly solutions in delivering projects in the coming years,” Sean Breen concludes.